Last Saturday morning was spent pootling about on a favourite chalk ridge taking photos of powder blue butterflies and scarlet moths. All rather glorious really. It was warm and overcast, buzzards were mewing overhead and skylarks were ascending to the heavens. I was in heaven too as the conditions were ideal for photography and despite the fabulous weather I had the whole hillside to myself – didn’t see another soul. How fab is that? 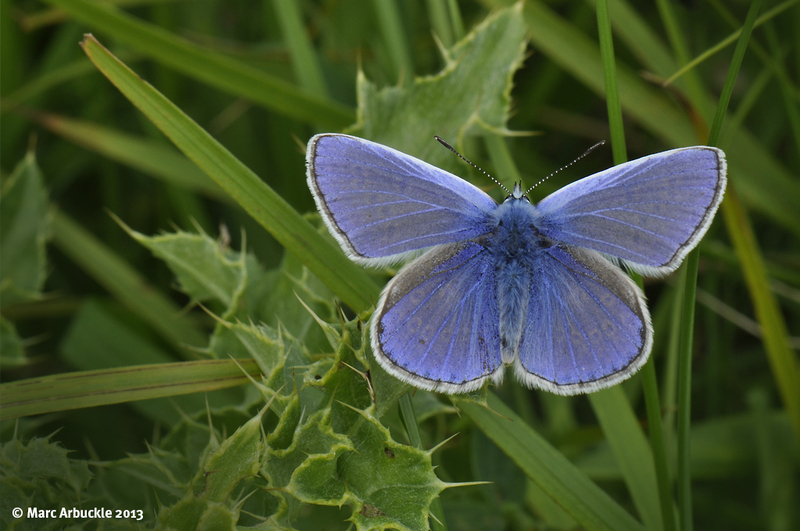 Although this is our commonest blue butterfly, the Common Blue Polyommatus icarus is no longer as common as it once was. So perhaps the alternative name of Icaris Blue is more appropriate. While the males like the one pictured above are blue on the upper side and real sun lovers happy to spend their all too brief days flitting from flower to flower. The female is far more reserved, happier resting and nectaring inbetween laying the eggs for the next generation. She’s also a less showy brown with orange spots and this can lead to confusion with the Brown Argus Aricia agestis (yes, I’ve done it). However, unlike the overall chocolate of the Argus ‘usually’ there is a dusting of blue scales especially towards the centre of her wings and her body ‘usually’ has a distinct blue hue. I italicise ‘usually’ in both instances because the amount of blue can be extremely variable. So if you are actively seeking the Brown Argus you may be better served gaining a clear identification from the spots on the underwings, particularly as males can have a bluish tinge. In dull weather this species can be found perched head down on grass stems and often roosts communally at night. This can lead to some amazing photo art opportunities if you are prepared to haul yourself out of bed before first light. If you are lucky enough to find them – at sunrise they may still be covered in morning dew. Thanks Lisa, he’s certainly a handsome fella. Snap! I’ve been photographing these again today, and got shots of mating pairs. Gorgeous little butterflies and such a lovely summery sight to see clouds of them fluttering around. Love your description of the chalk hillside. Thanks Lucy. I haven’t had so much luck with the Large Blue, see next post.